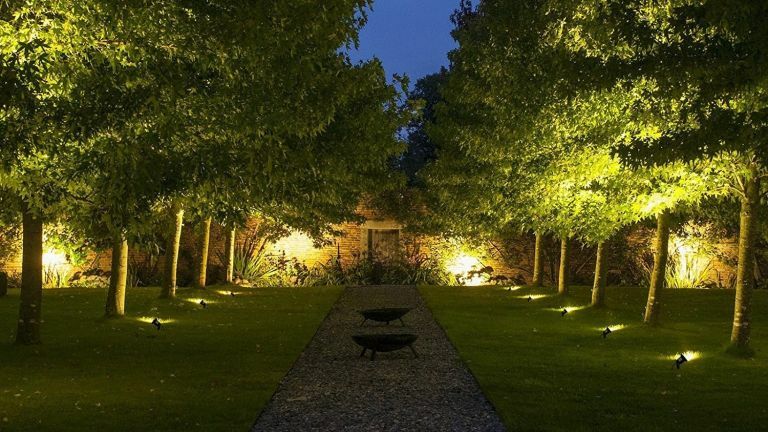 Garden lighting can be decorative, practical, or even a blend of the two, allowing you to make full use of your garden’s potential beyond a couple of rose plants, an evergreen bush, and a gravel path. In fact, they can bring gardens to life, and are especially valued in the summer months when dining al fresco, hot-tubbing or simply having a few glasses of wine in front of the chimenea are more commonplace than in winter. Planning your garden lighting can be tricky – combining the needs of style, security and simply being able to see when you put the bins out. But once you have decided on your priorities (be it task, accent or ambient lighting), the rest comes down to choosing the most attractive options in your price range. Choose the best garden lights in our guide, then check out our sourcebook of garden suppliers for all your garden shopping needs. What are the best garden lights? The most decorative garden lights are fairy lights, which can be woven intricately through trees, trellises, shrubs or bushes to create a subtle, atmospheric feel. Alternatively, sculpture pieces, like the Solar Bay Tree Lights, are a fantastic ‘quick fix’ decorative solution and can be placed along entrance ways or pathways for a pretty, illuminating feature. Wall lights are the perfect example of a practical yet decorative garden lighting, and they’re a warmer alternative to harsh floodlights which are probably a bit too intrusive if you’re planning on having friends round for an evening BBQ. Outdoor wall lights exist in all shapes and sizes, providing an opportunity for style aficionados to indulge their keen eye in their garden, as well as their interior decor. Those who are tired of tripping over the edges of their garden path may want to consider floor lights. Floor lights are often solar powered, so they’ll be ready and waiting to guide you safely down the middle of your path every time you return home in the dark. Our third pick, Long Life Lamp Company Outdoor Garden Spike Lights, provides an effective, decorative parameter for those who want to avoid stepping on their delicate shrubs in the dark. As we’ve already touched upon, garden lighting is, more often than not, solar powered, which means it involves absolutely no running costs. That being said, it relies on the sun’s power for their charge, so you may find that the light begins to dim fairly early into the night if the day has been particularly dull. Alternatively, you can purchase mains powered lights. These are often more powerful and are a more reliable addition, especially if you plan to be hosting late evenings in your garden during the summer. With everything to consider, we bring you the best garden lights from our favourite retailers below. With a length of 32 metres, you can weave these fairy lights through trees, shrubs and bushes, illuminating your garden in a subtly intricate way. Each LED light is powerfully bright are powered solely by solar power. The lights come with a detachable control box, allowing you to play around with the settings from wherever you’re sat. With a special winter power saving mode, you can even enjoy these lights from inside, for longer, and with 2 metres of wire before the first light, you should be able to place the solar panel in the ideal spot. These multi-purpose garden lights are a great choice if you’re looking for a subtle security feature or a way to illuminate a garden path. Mains powered, they’re a much more reliable choice than solar power, and they’re capable of a much brighter output, too. They’re compatible with both LED and halogen bulbs, and with white, blue, green and red just some of the colours available, there’s plenty of scope for you to make them the perfect decorative feature for your garden. If you’re looking to create a stylish outside area in which to wine and dine, this modern John Lewis wall light could be the perfect choice. Available in copper, silver and black, these mains powered lights will provide your outside area with a warm, reliable light. Unlike our previous choice, the wall light comes with long-lasting LED bulbs, which can be dimmed to create your ideal ambiance. Taking inspiration from traditional nautical style, this outside wall light combines the old with new ideas to create contemporary lighting that will look great on your outside wall. Designed in the UK and made in the Cotswolds, those passionate about investing in UK products will be pleased to know about the origins of this unique light. Blending textures, colours and materials, David Hunt has a range of nautical themed lighting, enabling you to create an exterior theme for your outside area. If you’re looking to invest in garden lighting to place near windows and doors, you may want to look at low level lighting, which won’t filter inside and interrupt sleeping. While strong and sturdy, these lights have been designed to softly filter light downwards, rather than outwards, which means the light emitted is contained, rather than dispersed. Featuring anti-rust coating with a black stainless steel finish, these are traditional lights that will look great in almost any outside environment. These lights have the beautiful shape of vintage tungsten lightbulbs, and look whimsical and delicate when put up in a tree or above your garden dining table on a string. Solar powered, they won’t cost you anything to run. And at just £15 for 6, these lights are incredibly cost effective, making them a great addition to your outside area.